One of the reasons EverGreen Farm is a success is the great people who participate in our Workshare Program. We could not do all of this work without their help. Thank you to those who have worked with us before. We hope you will consider joining us again in this worthwhile endeavor. EverGreen Farm is looking for people who are interested in coming to work at our farm each week to "earn" a 2010 CSA membership. EverGreen Farm Workshares are rewarded for their efforts on our behalf. And we just plain have a lot of fun while we are here working together. Its all good. You can learn more about our Workshare Program by reading over our 2010 Workshare Contract. In particular, we are looking for 2 individuals to fill specific needs on the farm. 1. We need someone who is willing to be a delivery person as part of their workshare arrangement. In general, this person needs to work at the farm in Smoot on Tuesday mornings for a few hours and then deliver coolers full of produce to various locations in the Lower Valley. This arrangement worked very well last year for a person living in Alpine. She drove to our farm every Tuesday morning to work for a few hours and then on her way home she made our deliveries. We set this up to be a win-win arrangement for the both of us. The only requirement is that this person own a vehicle large enough to transport several large coolers. Please contact Tara if you are interested. 2. This year we would like to find someone to work on our farm who enjoys yard work. We need someone to help with mowing the lawn, weeding, pruning, etc. so Shain and I can concentrate on growing and harvesting great veggies. This person will work the same hours and have the same basic arrangement as our other workshares, but their work assignment will be focused a little differently. Again, please contact me if you are interested. As of today, we have sold half of our memberships. Sign-up ASAP. See my last post for all the details. EverGreen Farm 2010 CSA memberships are now available for purchase. We can only offer a limited number of memberships, which will be sold on a first-come, first-serve basis. Please sign up ASAP! It is our experience that the majority of our CSA memberships will sell out within the first month. Jackson shares always sell out first. The cost for a 2010 membership will remain at $550. $200 will reserve your spot. All final payments are due by April 1, 2010. 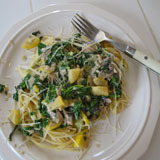 Our goal for the 2010 CSA season is to begin delivering produce the first week of May and go through the end of October. You will receive at least 20 deliveries of fresh produce over this 26-week period. During this time, we will take 4 “Sorry, No CSA delivery this week” vacations (dates yet to be determined). We are also giving ourselves 2 weeks flexibility in the schedule in case of weather related or unforeseen complications. For more detailed information about EverGreen Farm and how our CSA operates, please refer to the 2010 CSA Sign-up Form, the many previous entries on this blog, or contact us directly. Download a copy of our 2010 CSA Sign-up Form (below). Or call for a hard copy to be mailed to you. Fill in your contact information. Keep a copy of the form for yourself. You may also make payment by credit card through PayPal (see below). Please send us the completed sign-up form regardless if you pay by credit card or check. For your convenience, I have set up a PayPal payment option. You may use this payment link to pay for your membership with a credit card. There are two payment options: pay for your FULL membership or make the minimum DOWN PAYMENT for your membership. Both options include a small extra surcharge which PayPal charges me to let you make this credit card transaction. Please let us know if you have any problems downloading this paperwork or paying on line. Dare I say it? We are "famous"! This past summer I was contacted by two magazines wanting to feature EverGreen Farm in their publication. It was rather exciting. We answered their questions, put together the requested information and photos, sent them off, and got back to farming. A few months later it was a very nice surprise to get a package in the mail from Zone 4 Magazine with a little note that said "check out pages 2, 10, and 75." Here we are in the Winter 2009 edition. From their website (zone4magazine.com): "Zone 4 is a quarterly magazine devoted to gardening, landscaping, local foods, and outdoor living in the Rocky Mountain states of Montana, Colorado, Wyoming, northern Idaho and northeastern Utah. The editorial focus is on expert growing advice, colorful photography, and news around the region featuring local foods and sustainable growing practices." Page 2 is the Contents page which features a photograph I've posted on this blog of our chicken tractor. Page 75 is a map of the region pinpointing all the farms and businesses featured in this particular edition. Page 10 is the article written about our farm and a picture of Shain and Eli I took a few years ago (Eli looks so young). It's a very nice article. Since then we have had repeated calls and comments from friends and acquaintances saying "Hey, I saw you in a magazine!" "That is so cool!" I know. I know! Just before Christmas I received another unexpected package from Zone 4. It was a very nice surprise to look through this 2010 Zone 4 Calendar to find 2 feature photographs from EverGreen Farm. Again, both are pictures I've posted on this website. I love it! July is a picture of me walking through our garlic field. It really is one of my favorites. November is me with a group of workshares working out in the muddy fields. You can't hardly tell who we are because we are such a mess. So for Christmas, many of my family members received Zone 4 calendars. If they like it or not. Because "Hey, we are famous!" This is a picture looking in through the store front window to my Great-Grandfather's store. My Great-Grandfather John H. Tillotson (my mother's grandfather) owned and operated a mom & pop store in Ogden, UT back during the Depression. This picture has peaked my curiosity and I want to lean more about his endeavor. I do remember hearing how generous and kind he and my great-grandmother were. They frequently gave food to those who could not afford to buy it. I am told my great-grandfather would spend hours arranging the food in his front window. He wanted it to look perfect. Gee, must run in the family. Shain and I also spend a good amount of time (sometimes too much time) making sure the food we sell looks great. We are very particular and want to only give the best looking produce to our customers. I've also been known to spend a good amount of effort, time and consideration when setting up our produce stand at the farmers market. I want it to look perfect. And I'm told it looks pretty good. A lot. This picture makes me smile. Notice the Tillotson's name on the window. Notice the artistically placed produce. Notice the sign "Where Every-thing's Good To Eat". Notice the small little "s" added at the end of "Every-thing" as though it was an after thought. As my mother says "He was so cute!" Hello everyone! 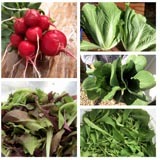 We are back from the holidays and I'm back to farm paperwork and organizing sign-ups for this coming 2010 CSA season. More on that later this week. Here is a quick update on some of the work we did at EverGreen Farm at the end of our 2009 season. Remember this picture from my last newsletter back at the end of October, 2009? All those weeds! I was almost too embarrassed to show you how bad this area of the farm had become. It was one of those places I wanted to avoid. And I did frequently. With all the food we needed to harvest, and Shain returning to the classroom, there just wasn't any extra time to weed. Then the season came to a close, and the weather was kind to us, and we attacked this weeding nightmare! Like I said, the Fall weather was kind to us this year. We were able to get a lot of farm clean up done before the snow came for good. Look at this SAME area of the farm just a few weeks later. I love it when we get together a good crew of workers to knock out a huge job. I love it when that job involves weeding. The brownish plant remains you see above aren't weeds, they are rows of beets that never grew to full size, a problem we experienced too often last year. One of Shain's major goals for this past Fall was to clean out and prepare all the greenhouses before winter set in, so we could be ahead of the game in the Spring. And again, with the help of some great workers, we did it! Here are a few of us working in greenhouse #4. You can't see it, be we are laughing and carrying on, having too much fun for our own good. I'm smiling the most because I am so grateful for the help. As I mention quite frequently, Shain is always thinking about ways he can improve our farm. One tactic that is necessary for farming successfully in our climate is to push the limits and start growing as early in the spring as absolutely possible. Usually our Falls are so hectic we don't get to cleaning out and preparing the greenhouses. And there they sat, full of dead plants, weeds and whatever. It's been a real mess in the spring. NOT this year. It's going to be much better this Spring, as long as other weather factors don't interfere. Now let me show you more of the process we go through here to improve the soil here on EverGreen Farm. Animals are an important part of our farm. This is one of four pigs we raised in 2009. My how they've grown. Pigs are incredible compost makers. Stinky at times, but incredible at turning garden waste into compost. For several years now, we've "made" these two large piles of compost. The "old" pile (below, left) and the "new" pile (below, right). I am still amazed at nature's process of turning garden debris, rotten hay, and animal waste into deep rich compost which has no resemblance to it's origins. We used most of the "old" compost pile this Fall. Come Spring, we'll use the rest of it and then rotate the "new" pile over into it's place. By then it will have decomposed considerably, but not completely. Next, we'll clean out the animal pens and make a "new" pile again. Then in the Spring and Summer, school students will come on a field trip to our farm and start climbing and playing in our "dirt" pile. I'll tell them they are standing on a pile of "composting POOP". The kids will either laugh or freak out. I love that part of my job. On this particular day, Shain and Greg went to work on spreading compost into greenhouses #1 & #2. The compost was topped off with a thin layer of leaves. Leaves add organic matter to the soil. It's essential to achieve the right balance of carbon (leaves) and nitrogen (compost). And the final step before "putting the greenhouses to bed for the winter" was to give each one a nice soak of water. Watering inside the greenhouses simulates natural cycles of precipitation, freezing and thawing. This Winter has been a bit more enjoyable knowing we are a little bit a head when Spring comes around again. It's the first week of January now. Shain has most of his seeds already ordered. He's typed up his yearly farm plans. He is ready to go. Me? I have a small drawer full of paperwork to go through (taxes, ugh). But first we need to get our 2010 CSA sign-ups going. Are you ready for another year of great, fresh, local produce? I am!